Gold softened moderately overnight, but trading remained confined to a narrow and well-worn range of $1286 - $1293.55. It climbed to its high during Asian and early European time against a slight pullback in the US dollar (DX to 97.02). The dollar was pressured from some early strength in the pound ($1.3152 - $1.3191) and the euro ($1.1230 - $1.1248) as the UK Parliament passed an emergency bill to prevent a no-deal Brexit and the EU’s Barnier said they could allow Brexit delay until May 22. A decline in the US 10-year bond yield (2.528% - 2.497%) and mostly weaker global equities were a tailwind for gold with the NIKKEI up 0.1%, the SCI up 1.2%, European markets were off from 0.2% to 0.5%, and S&P futures were -0.1%. Later during European hours gold slid to its $1286 low, weighed by a recovery in S&P futures to unchanged (Trump tweets that despite the unnecessary and destructive actions taken by the Fed, the Economy is looking very strong, the China and USMCA deals are moving along nicely, there is little or no Inflation, and USA optimism is very high!) and a rebound in the DX (97.22). The greenback was boosted from weakness in the euro ($1.1218, much weaker German Factory Orders report, minutes of ECB’s March meeting cite persistence of uncertainties continued to weigh on growth outlook), and a pullback in the pound ($1.3130, concerns of a longer Brexit extension). At 8:30 AM, a much better than expected US Jobless Claims report (202k vs. exp. 218k, 50-year low) lifted S&P futures (2880), and brought the US 10-year bond yield back over 2.50% to 2.521%. The DX surged to 97.34, and gold was pushed lower. 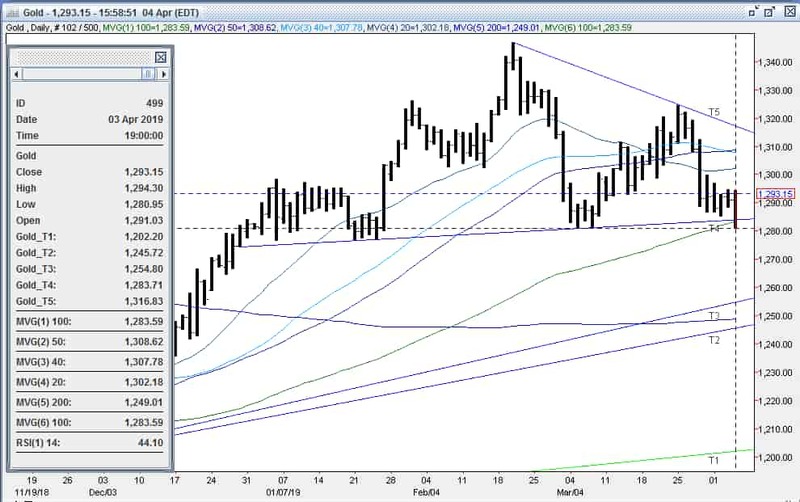 The yellow metal tripped stops under $1285 (double bottom 3/8 and 4/2 lows), $1284 (up trendline from 12/28 $1274 low), and $1283 (100-day moving average) on the way to $1281 – where support from the 7 bottom low at $1277-80 (12/28, 1/4, 1/21, 1/22, 1/23, 1/24 and 1/25 lows) finally held. The move was aided by some slightly dovish comments from the Fed’s Williams (“new normal” for US economic growth and rates won’t be at rates seen in the 1990’s, sees growth at 2% this year). However, lacking follow through selling and amid some bargain hunting bids, gold rebounded quickly to $1284.50. US stocks turned down after their opening (S&P -3 to 2870), with a pullback in oil (WTI from $62.74 to $61.88) contributing to the decline. The 10-year yield slid to 2.504%, and the DX ticked down to 97.26. Gold continued its rebound, and tripped some short covering stops over $1285 on the way up to $1289 by late morning. 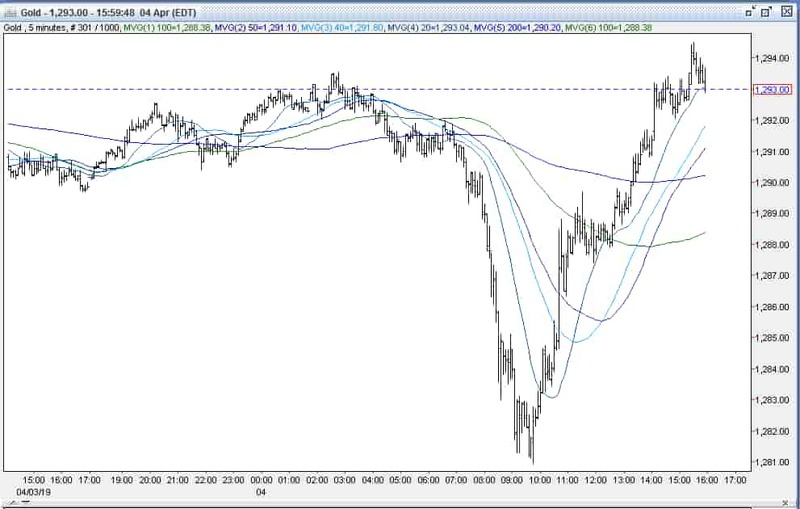 Equities continued to soften into the afternoon (S&P -6 to 2867), weighed by some bellicose comments from Trump threatening Mexico with auto tariffs or a border closing along with some hawkish comments from the Fed’s Mester (rates may need to move a bit higher if economy performs as expected) and Harker (sees economy will pick up steam in coming months, sees growth above 2% for 2019 aided by strong job market, inflation slightly higher than 2%). Weakness in the Health Care, IT, and Real Estate sectors led the decline. The 10-year yield was steady around 2.505%, while the DX was similarly stable around 97.30 - supported by further weakness in the pound ($1.3061, concerns over fine timeline that PM May faces to save the UK from falling out of the EU without a deal). Gold clawed back to reach $1293, with additional short covering seen. Later in the afternoon, US stocks turned positive (S&P finished +6 to 2879, Materilals, Energy and Consumer Discretionary sectors lead gainers) while the 10-year yield edged up to 2.513%. 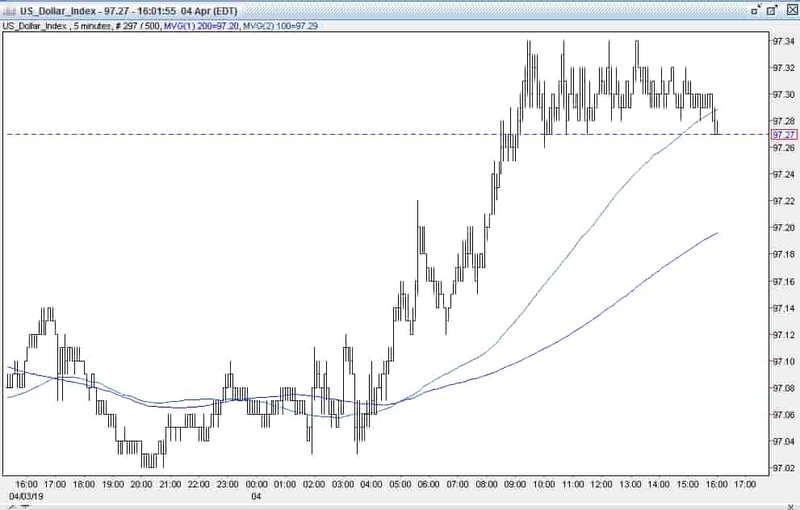 The DX held steady around 97.30, but gold probed higher. The yellow metal, still fueled by covering shorts reached $1294.50 – just shy of a key reversal at yesterday’s high of $1294.60. It finished up $2 at $1293. Open interest was up just 0.1k contracts, showing a balance of new longs and some short covering during gold’s bounce to $1295 yesterday. Volume was lower with 199k contracts trading. Bulls cheered gold’s bounce today, rallying back from the breach of key technical support at $1283-84 (head and shoulders neckline, 100-day moving average) to finish with a modest $2 gain. While not technically a key reversal day (would have had to eclipse yesterday’s $1294.60 high), it certainly is a bullish technical development. Bulls were especially pleased that gold was able to reverse and firm despite a gain in the DX, the 10-year yield remaining north of 2.50% and stronger equities. Bulls feel the selloff from $1325 has been overdone and have used the dips to get long (er) at more attractive levels. Bulls also maintain that gold’s correction down from $1347 had been overdone, and feel that it will consolidate again in front of the confluence of support levels from $1284 down to $1277. Bulls feel that the trend is their friend and that the up move going back to the 8/16/18 $1160 low is still intact. They look for the strong rally over the past 7 months to carry further, expecting continued volatility in equity markets along with the surprisingly dovish statement from the Fed at its last meeting to keep downward pressure on US interest rates and the dollar, which should help drive gold higher. Bulls also point to last Friday’s Commitment of Traders Report (as of 3/26) that still has the large funds with a significant gross short position (95k contracts). Therefore, the bulls feel the gold market remains set up to move higher, as these shorts will provide fuel to further upside moves – when forced to cover. Bulls look for a consolidation ahead of $1277-84, and then for a quick rebound to the old support at $1300 - $1303. Bears were expecting a run through key support levels once $1284 was broken this morning, but were disappointed with the lack of follow through selling along with the strong bargain hunting buying that led to today’s strong reversal. Many bears cited an unwillingness to aggressively put on / add to short positions ahead of tomorrow’s US Jobs report as a reason the decline fizzled, but remain undeterred. Bears remain comfortable with gold’s recent price action on its move down from $1325, having made lower highs in 7 of the last 8 sessions, and lower lows in 6 of the past seven. Bears believe gold’s downside has legs, and maintain that its recent bounce from $1281 was just a modest uptick within the early stages of a more significant downside correction. Though some bears took some profits on gold’s dip toward $1281 earlier, other bears still remain comfortable selling into strength and will continue to use rallies (like today’s rebound) as entry points for getting short(er). They maintain that gold’s advance to $1347 had been overdone – having rallied $70 since the $1277 low on 1/24 (5.48%), $114 since the $1233 low on 12/14 (9.25%), and $151 since the $1196 low on 11/13 (12.63%). They feel that the 20% correction in equities – much of which occurred during very illiquid holiday trading – was also overdone, and expect the rebound seen over the past 13 weeks to resume (encouraged by golden cross in the S&P on Monday – 50 day moving average crossed 200-day moving average). 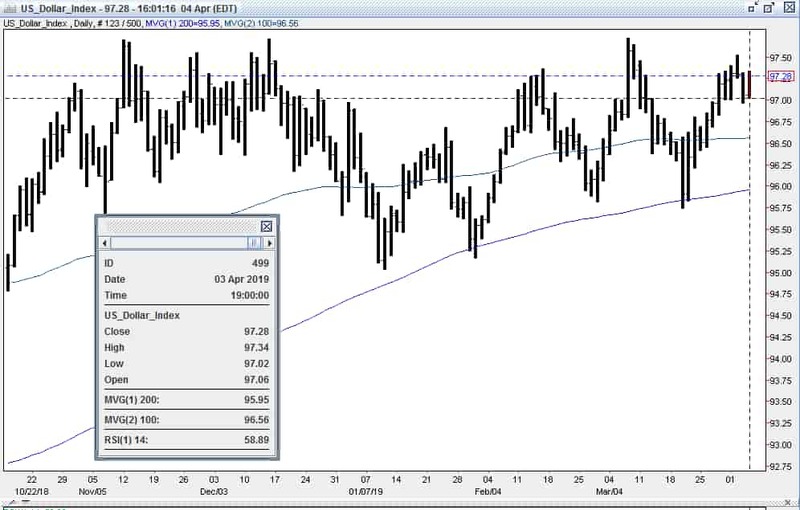 Bears also feel that the strength in the US dollar has legs – despite the surprise dovishness from the Fed the week before - given the recent lousy Eurozone data that forced the German 10-year bund yield back into negative territory last week. They feel that the US remains the sole global growth engine, and will continue to grow – despite the pronounced slowdown in global growth prospects. This, they feel, should keep the US dollar well bid and will continue to pressure gold lower. Bears expect long liquidation to resume, and look for a retest of initial support at $1285 (double bottom 3/8 and 4/2 lows) to lead to a test of the confluence of technical support just below: $1281-84 – 5 bottoms 3/4, 3/5, 3/6, 3/7, and 4/4 lows, $1284 – up trendline from 12/28 $1274 low, $1284– 100-day moving average, $1277-80 - 7 bottoms – 12/28, 1/4, 1/21, 1/22, 1/23, 1/24 and 1/25 lows. Bears feel that a breach of these levels should trip more significant long liquidation that will open up a move into the mid $1260’s. All markets will continue to focus on geopolitical events (especially Brexit news), developments with the Trump Administration (especially on US-China trade, potential legal issues), oil prices, and will turn to reports tomorrow on Japan’s Leading Index, Germany’s Industrial Production, US Payroll Report, Baker-Hughes Rig Count, Commitment of Traders Report and comments from the Fed’s Bostic for near term guidance.